I’ve spent the last few weeks reading the Fast Forward MBA in Project Management, a great book by Eric Verzuh who is, besides a bestselling author, the president of The Versatile Company, a firm that delivers training on project management topics to thousands of professionals every year. This is the first best seller on the topic of Project Management I have read, and I do need to say that it is a best seller for a reason. Reading a book about project management is a welcome sidestep from reading about the Microsoft Project and Project Online tools. This book describes processes, and methodology more than what button you should push next. I hope you’ll like the review on: The Fast Forward MBA in Project Management. Best seller, fifth edition, cool cover design, Online content, PMP study tips. The cover looks very modern, the inside not so much, it’s printed on boring black and white paper. But it has 480 pages of great content and a good amount of diagrams and highlighted areas. The book contains short chapters ranging from 10 to 25 pages, where in the author describes a specific topic within project management. These topics are bundled in five parts that focus on a specific project life cycle moment. I was particularly impressed with the risk management chapter (chapter 7: Risk management: Minimize the threats to your project). It gave me a great insight on how Risk management plays a huge part in project management. And that championing of Risk Management has been missing in the books dedicated to the Microsoft applications (although the tool does support it). There is also a great chapter on the Work Breakdown Structure (WBS). In the chapter Eric tells us “… If done well, it can become the secret to successful project management. The WBS is perhaps the most powerful technique in this book.”. So be sure to read and understand chapter 8 :-). Chapter 18 focuses on how to get control over your projects, programs and portfolio as a whole with “The Enterprise Project Management Office” as a holy grail solution. The chapter has a great Stellar Performer case study revolving around the Bill & Melinda Gates Foundation. And at the end of the book, and in the free downloadable content there is even some attention for the application Microsoft Project, Awesome! Chapters end with either PMP example questions or Star Performer case studies. The case studies give a nice insight on how theory comes to practice and supports the belief of the author that performing in line with the theory will result in a better performing (project) organization. The PMP Example questions are a nice challenge for anyone that is considering taking the exam. Of the 55 questions I scored 39 good answers, that is 71 percent, I think that’s not a bad score for a first try. Eric Verzuh agreed to give away one autographed copy of the book to the winner of a contest in this post. I am a big fan of the chapters describing Risk management, and I’m curious to what extent organizations use Risk reduction techniques in combination with Project Management tools (such as but not limited to Project Server and Project Online). If you want to win a copy of The Fast Forward MBA in Project Management please describe how your organization is acting on Risks. Be honest and be precise, the best reply will be contacted by me or Eric himself to get shipping address details. This contest is open until the first of September. I enjoyed reading the Fast Forward MBA in Project Management a great deal. If you are considering grabbing a copy of the book here is a direct link. Learn more about the author by visiting his company website. You can also hear an interesting podcast done by Contriber. In our Microsoft Project courses, I encourage participants to analyze risks with the entire project team, document specific risks indicating the (financial and scheduling) impact to the project, and record what steps can be taken to mitigate the risk in the event things don’t unfold as anticipated. Since you know I’m I PPM consultant like yourself, I could in theory only answer the question with the best practices we teach or advice our customers in trainings and implementations. If they than also do something with it, is up to them 😉 So, I just want to thank you for bringing the book to my attention. 🙂 Keep up the good work! It depends if you want the theory or the practice Erik: In theory, we continually assess risks for probability and impact throughtout the life of the project. We document this assessment and decide a response to the risk. We then track our actions in line with that response. In some cases, we may build contingency into our budget or schedule. In reality, most of the above is done intuitively and the risks are probably recorded after a response has been decided and is in action. In addition, rather than an explicit consideration of the risks surrounding a piece of work, most developers I work with, tend to build a degree of uncertainty or risk into their estimates. I’ve stopped getting too upset about the gap between theory and reality but when I can I just try to vocalise and make explicit what most people are doing any way. Hi Simon, thanks for the honest response. I just recently started a project at JSR internally. It’s finding out the use of PowerBI for internal use and see if we can find applications for our clients. Because of the book I started monitoring the risks and for the first time actually thought about all the fields that we can fill in on Project Online. Next week will be our first progress meeting and I’m curious to see if my team has looked at the risks and actively thought about them. I also triggered them to think of new risks and what should/could be done about them. Simon, your name is on the growing list of contestants 🙂 hope more will follow. Thank you for publishing this review. Since you and many of your followers promote using the right tool to make theory a reality, I would add that I find SharePoint ideal for recording and TRACKING risks (yes – emphasis on tracking them!) 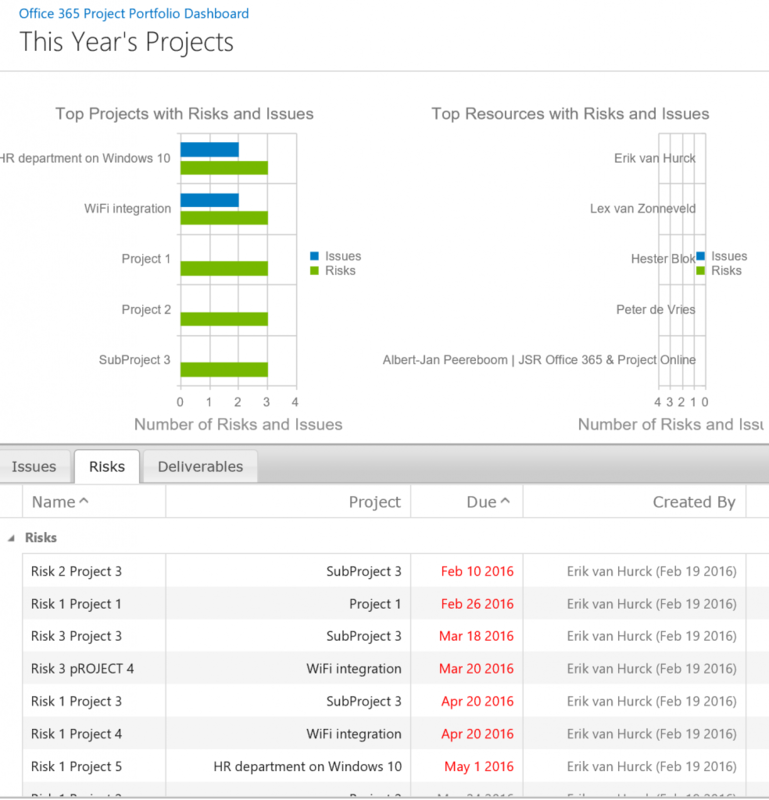 The risk list provided in the Microsoft Project Online/PPM product is a SharePoint list. The simplicity of keeping a running log of what’s happened for the risk means that it is more likely that teams will actively monitor risks. Hi Eric, thank you for joining. And thank you for writing the book of course haha. I completely agree with the statment that tracking risks is a very important part of the solution and available in Project Online/PPM. Erik – I loved Eric Verzuh’s article on Don Kingsberry and enterprise project management office (EPMO) at Microsoft’s Gates Foundation. I’ve used MS Project primarily for sequencing interrelated tasks in many projects and industries; however, the rest of the prioritization, risk, change management . . . . . . . . aspects are what many organizations need to make Project consulting totally effective. Organizations I work with are encouraged to implement risk ownership not only to assign and follow risks using a risk register or a risk list (using SharePoint/EPM) but also to ensure that any change to a risk driver or the outcome of a risk response measure are monitored and acted upon. That’s where a tool comes in handy to foster a proper follow-up and reporting. On the finish line you submitted your comment 🙂 you will be added to the list of contestants. For those who participated, congratulations you will all be competing for the book. However, I’m currently involved in a couple of time consuming projects and will be picking a winner when time permits in the coming weeks. Thank you all for the valuable comments and for reading the blog. Stay tuned, big news is on the way!